You know how sometimes you get an idea, and you think: “This will never work.”? We had one of those. It was last minute, long shot, and what do you know? It worked! At least so far. Being good local citizens, we love to shop locally and support locally owned small businesses. Why go to corporate pizza places when there are great options locally? Like good pizza lovers, we were following the buzz around the news of the demolition of the original Shakespeare’s Pizza location (Columbia Daily Tribune article) at 9th and Elm. After some hand-wringing, we were pleased to learn that they moved next door temporarily while the property owners build a new structure that will have a specially designed space to hold the pizza place we all hold dear–at its original address. We were reading Pizza-Man-in-Chief Kurt’s testimony to the City Council about the need for a more intentionally designed space with all the charm that original place had. That’s when we got the last-minute idea: there have been a lot of folks lamenting about the end of an era, etc.–essentially forgetting that it’s not about the building. It’s about he good memories we have of spending time there with friends and loved ones–and the pizza. 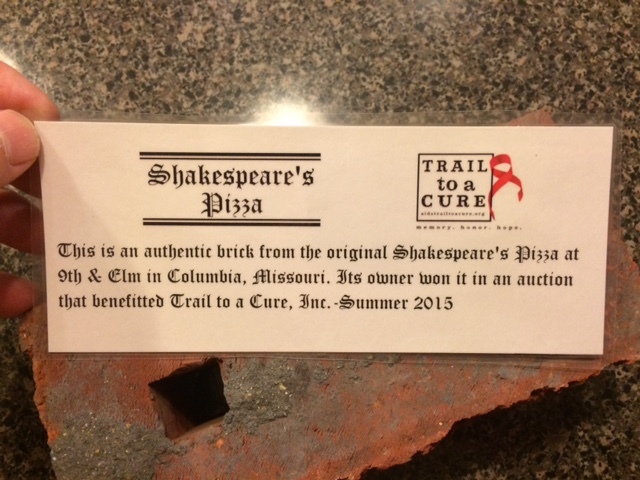 We got in touch with our good friends and long-time supporters, Shakespeare’s, and we asked if we might obtain a few of those bricks from the facade that were sure to be heading to a landfill somewhere. “Who wouldn’t want to own a piece of those memories?” thought we. 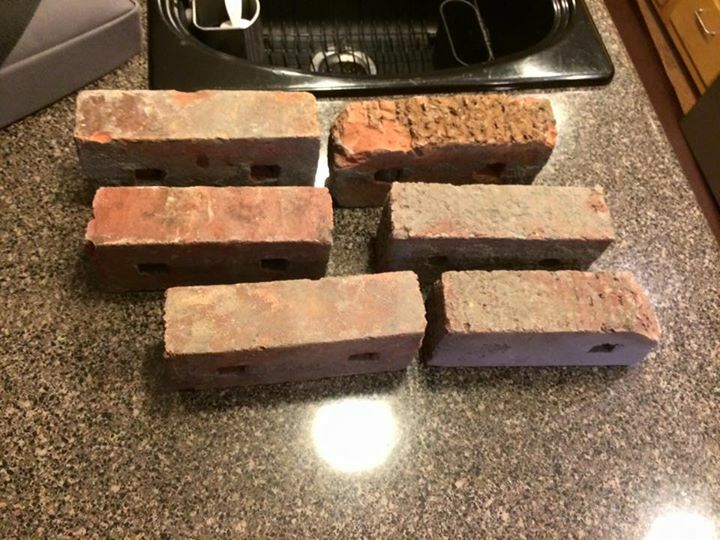 Kurt and friends hooked us up with 6 of these bricks! We tidied them up a bit, but not so much that you can’t still smell the pizza (just kidding–they don’t smell like pizza). Why, you ask? We are auctioning them off on eBay with all proceeds going to our nonprofit cause! 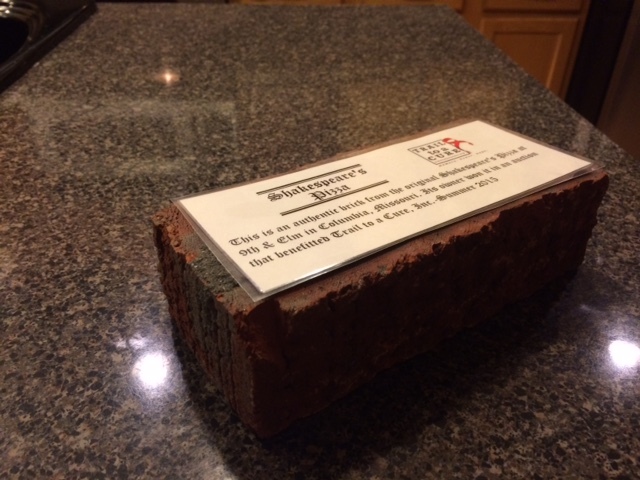 You can own a brick and help provide HIV/AIDS research by putting more medical/grad students and others in labs at MU’s Bond Life Sciences Center, and supporting services for people living with HIV/AIDS locally. You can participate in the auction! It’s as easy as pie (pizza pie?). If you know someone who might be interested–they don’t have to be local–please share this! PS: Be sure to check out the temporary Shakespeare’s around the corner on 8th St. (formerly Tin Can, BBC II, Los Bandidos, etc.) –we were just there and the pizza is as great as ever! We tried something new last weekend: a celebration at the end of our fiscal year that focuses on what we have achieved as an organization and as an opportunity to share our mission with those who may be vaguely aware of TTAC, but have never had the opportunity to ask questions. We had many great one-on-one conversations that were quite interesting, and there was significant focus and discussion of HIV/AIDS. One event attendee asked, “What is PrEP?” Our team members did our best to answer the question, but we decided to do a blog post to explore the topic further. According to the CDC, “PrEP” stands for Pre-Exposure Prophylaxis. The word “prophylaxis” means to prevent or control the spread of an infection or disease. The goal of PrEP is to prevent HIV infection from taking hold if you are exposed to the virus. This is done by taking one pill every day. These are some of the same medicines used to keep the virus under control in people who are already living with HIV. That’s a pretty straightforward answer. Note the bit about “taking one pill every day.” When we answered off the cuff, we said the opposite. That’s why we’re not in the business of providing services–but rather fundraising! There’s a ton of great info on the CDC website on this topic, such as whether PrEP is a vaccine, how to get it, how to pay for it, who should consider taking it, and much more. Please explore that site for this info, in the interest of keeping this blog post short. For more information about HIV/AIDS testing, prevention, and treatment, we recommend getting in touch with Columbia/Boone County Public Health. It’s our favorite time of year for Trail to a Cure. We’re wrapping up our fiscal year and tallying all the results of fundraising. That means it’s time to pass on the results of a year’s hard work to our beneficiary organizations for the year. We are pleased to announce that we have raised $11,000 this fiscal year to fight AIDS. This brings our historical total to $95,000 since our founding. Checks are being sent to 2015’s primary beneficiary organizations* as we speak! Mizzou’s Bond Life Sciences Center is receiving funds to support the efforts of students who are working in labs with HIV/AIDS researchers. Many of these students are medical students, and their experience will help share their future careers as doctors who have a special insight into this disease. amfAR, the Foundation for AIDS Research is receiving funds to support innovative research projects for HIV/AIDS. As primarily a fundraising organization, we depend upon the donations, sponsors, event participants, and the willingness of the community to make monetary gifts in support of our mission. Thank you to all who have supported our efforts this year! See you on the trail next May 7th for our major fundraiser–the 2016 Ride/Walk/Run. PS: We evaluate our beneficiary organizations’ applications each year around this time, and we are in the process of selecting our beneficiary organizations for 2015-2016. Candidates for funding include amfAR, Bond Life Sciences Center, and Rain of Central Missouri. Watch for news soon! *Rain, while not a designated beneficiary for 2015, received support from TTAC during this year’s holiday food drive.